Active volcanoes, warm and cold sea currents, the territory stretching far from north to south, and a complex terrain add to the diversity of the Islands' wildlife. In this area it is easy to encounter representatives of the Japanese-Korean, Manchuria and Okhotsk-Kamchatka flora and fauna complexes. The Islands are home to more than 50 species of higher vascular plants included into the Russian Red Data Book. 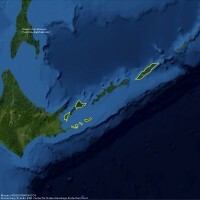 Birds migration routes cross the area of the Southern Kuril Islands. Among all the bird species living here 30 have been added to the Russian Red Data Book. Local rivers are spawning grounds of salmon. The coastal zone of the islands is rich in multiple colonies of sea waterfowl and rookeries and breeding-grounds of sea mammals.